All this week I’ll be showing pictures from my collection of vintage bathing photos. 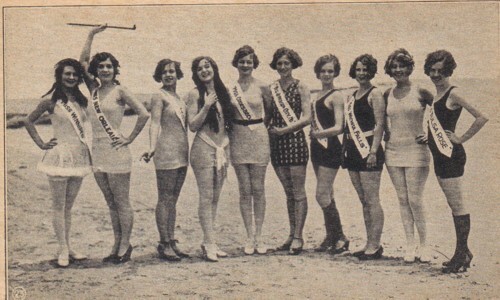 This line-up of beauty contestants from the mid 1920s shows a very modern group of young women. There is only one contestant, Miss Winnepeg on the far left, who is wearing a suit with a real skirt. Only two women do not have bobbed hair. And while some of them are still clinging to the old-fashioned idea that a lady must wear stockings, most are bare-legged, and three have rolled their stocking to below the knee. Just a few years before this, most would have been in knee-length suits with heavy black stockings. What a difference a few years made! 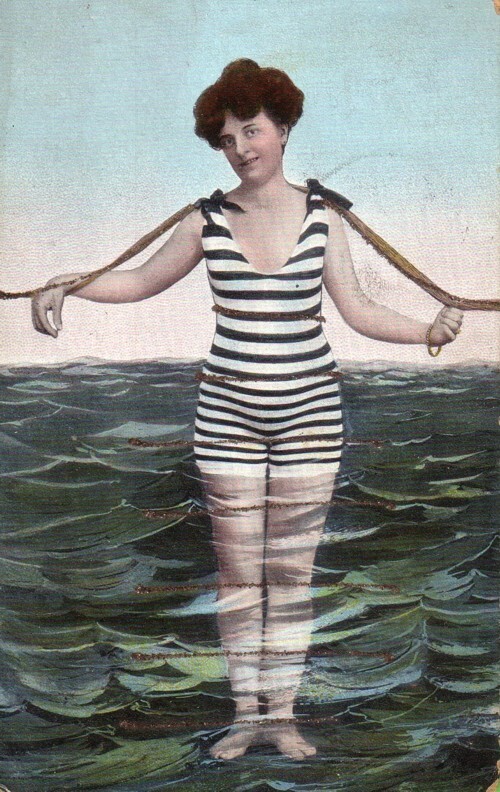 This card is postmarked 1906, but if you were to have gone bathing in a suit like this in that year on any beach in the US, you most likely would have ended up in jail! 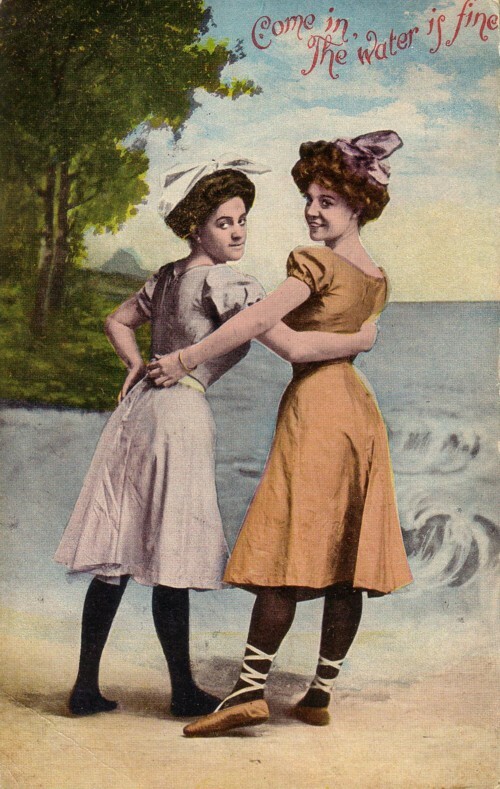 The typical bathing costume of the time was skirted to the knees, had sleeves and was worn with stockings and shoes. Notice that the water has been painted in and the lines of glitter which add a bit of dimension to the card. I know nothing about the people in this photo except for the obvious fact that they are having a blast! It’s the early 1920s – the women have bobbed hair, but their bathing suits are a bit (okay, a LOT) dowdy, with long skirts and stockings all around! 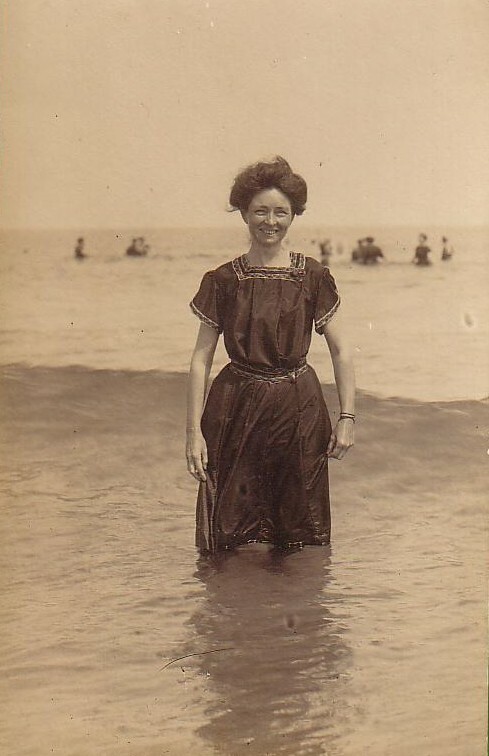 This girl of the mid 1920s is clearly breaking the rules of just a few years earlier, but she stilll clings to the rolled stockings and shoes on the beach. These. oddly, look like street shoes, so she may just be posing after a walk along the boardwalk. Looks like making fun of fat people is a sport that has been played for a very long time. 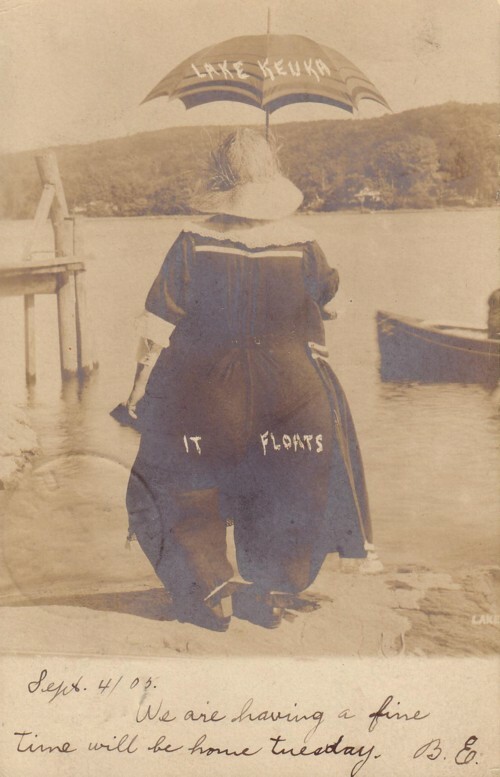 The card is meant to be funny, but I just find it sad; here we are 102 years later, and still it is acceptable to laugh at people who are not of “perfect” body shape.